The Shadespot is a beautiful option commonly used for patios, decks, outdoor cafes, break areas, and restaurants. Spring is here and as the weather warms and warms toward summer, you may want to find ways to make better use of the property surrounding your home, so you can be prepared to entertain family and friends and enjoy your outdoor space fully. If you are looking to extend your livable space in an economical and outdoor-friendly way, it’s time to consider Sunesta shelters for your home. Carroll Awning is proud to install a number of Sunesta shelters in the Baltimore and Washington, D.C. metro area, including Virginia and Maryland. A few of these Sunesta shelters are the Shadespot, the Suncover, and the Sunplus. If you want to enjoy the outdoors while being protected from the elements, than the Shadespot is the perfect awning for you. The Shadespot is commonly used for patios, decks, outdoor cafes, break areas, and restaurants. 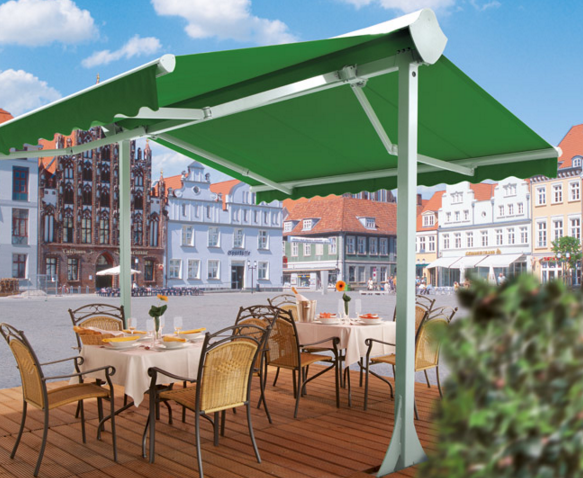 As this type of awning is freestanding, it offers up to 600 square feet of protective shade anywhere you need it. This versatile retractable awning is ideal for those who cannot easily mount a traditional wall mounted awning. This type of awning provides sun protections to an already existing structure. The Suncover is ideal for sunrooms, pergolas, skylights, and other such structures. Its unique design makes it simple to add to the existing rails of a structure without having to mount and part of the awning to a traditional wall surface. This makes it incredibly popular amongst Sunesta shelters, as it is highly convenient. This awning is similar to The Suncover, only it includes larger aluminum side rails with attached rain gutters. The additional gutters attached to the Sunplus make them the best awning choice for a number of homeowners. When extended fully, The Sunplus fabric overlaps the rail gutters to provide additional protection and direct rain run off to the front of the awning. The Sunplus can be installed to a wall or soffit and then supported with uprights at the end of the rails so it can effectively protect you from rain. The Carroll Awning Company provides the best quality, energy-efficient canopies, awnings, Sunesta shelters, and frames for any business, restaurant, home, or apartment. We design, create, and install custom-created canopies and awnings all year round! For a free estimate, call 1-800-999-5617 or click here to contact us online. You can also follow us on Facebook, Twitter, Google+, and LinkedIn.